The Baltimore Bibliophiles form the City of Baltimore's premier meeting point for book enthusiasts. 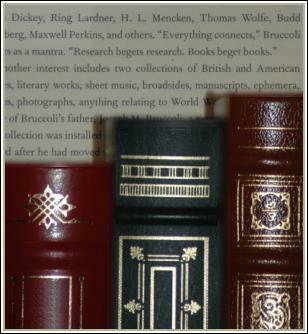 With formal meetings five times a year, the group is a forum for invited speakers on the finer points of book appreciation, particularly collecting and the book arts. Since 1954, it has met at venues like The Johns Hopkins Club, The Walters Art Museum, and Goucher College for presentations on everything from unusual authors and artisanal bindings to preservation and restoration. As the group is an affiliate of the Fellowship of American Bibliographic Societies, the membership of The "Baltimore Bibs" enjoy invitations to FABS events and the twice-annual FABS journals. Edited by Donald Farren and August A. Imholtz, Jr., this volume incorporates an account and catalog of early children's books of Baltimore by Linda Lapides and extensive information on the history of the club and bibliophily in Baltimore. Distributed by Oak Knoll Press, New Castle, Del. The official announcement is available. A convenient, printer-friendly brochure for those interested, with contact information, is available here .